Sarah asks: Who invented the TV dinner? Like many products that have enjoyed massive and steady popularity over the years, there’s a long line of folks who claim credit for the invention of the TV dinner. The evolution of the product began in 1941 when Maxson Food Systems Inc. produced the first ready to eat frozen meal. These dinners were called “Strato-Plates,” which were complete meals to be reheated and served to both civilian and military airline passengers. They consisted of meat, a potato and a vegetable, served on a plastic plate with three dividers. Unfortunately, because of financial setbacks coupled with the death of the company’s founder, Maxson’s frozen meals never made it to the grocer’s shelves. Many believe that this product therefore doesn’t qualify as a true TV dinner as it was only available on airplanes, and was never available to the general public via retail sale. Next up, in the late 1940s, Jack Fisher founded a company called FridgiDinners, that sold its “just reheat” wares to bars and taverns. This, of course, means it has the same problem as Maxson, if you want to be a stickler about the “TV” part of the equation. Albert and Meyer Bernstein co-founded Frozen Dinners Inc. in 1949, and that’s when things really began to happen. They sold their aluminum dinner trays with three compartments in the Pittsburgh area, and by 1950 had manufactured an impressive 400,000 dinners. Their product continued to grow in popularity, and in 1952 the Bernstein brothers organized the Quaker State Food Corporation, expanding their sales area east. By 1954, their new company had sold over 2.5 million frozen dinners, presumably some of which were eaten while people watched TV, though at this point it certainly wasn’t the focus. After the Bernstein’s Frozen Dinners began selling like hot-cakes, Swanson, already a well-known brand that consumers trusted, got in on the action. The oft-told tale, whether true or not is up for debate, is that Swanson executive Gerry Thomas put forth the idea of the “TV dinner” as a way to use a vast surplus of Thanksgiving turkey (one number bandied about is 260 tons) the company was sitting on. Whether that’s true or not, the first TV dinner offered by Swanson was a Thanksgiving dinner containing sweet potatoes, turkey with cornbread dressing, and frozen peas. It sold for 98 cents per dinner (about $9 today) and took about 25 minutes to re-heat in the oven. 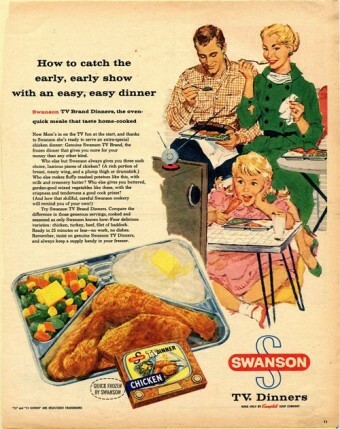 As to why Swanson so often gets the credit for the first TV dinners, despite the earlier examples of similar frozen food items, they based their advertising campaign around the hottest trend of that year – the TV, with some claiming the inspiration came from the fact that the tray resembled TV’s at the time (though this is a huge stretch when you look at the original 3 compartment tray that had a triangle as the main compartment). More likely the name was simply thought up as part of a clever ad campaign and the design of the tray had nothing to do with it. Whatever the case, thanks to Swanson, “Frozen dinners” became “TV dinners” and the company sold more than 25 million of them that year alone, or $24.5 million worth, which is about a gross of $220 million today. The introduction of microwave ovens presented a huge turning point for the TV dinner, and it rose to the challenge admirably. The former design of the metal trays, of course, by necessity had to become a thing of the past, and “microwave meals” are now typically packaged in plastic containers with plastic covers, occasionally with a thin layer of aluminum lining to crisp things up (as with Hot Pockets, pot pies, and other items that have a crust). A bacteriologist named Betty Cronin, who was employed by Swanson at the time the TV dinner was first made by them, has stated that is was actually Gilbert and Clarke Swanson themselves who originated the idea of the TV dinner, while other members of the team worked on such details as design and advertising. Cronin herself was tasked with finding foods that would all cook at the same rate and about the same temperature. The one thing they all could agree on was that none of them came up with original idea for frozen dinners. But Swanson’s was responsible for the TV dinner’s phenomenal success. The first TV dinners consisted of simple, hearty comfort food such meatloaf, turkey, and Salisbury steak, with side dishes of potatoes and green beans or carrots. Nothing fancy, and all available for the price of $0.98. Desserts were added to the dinners in 1960. Also a member of the Frozen Foods hall of Fame: Robert E. Rich, the “father of non-dairy creamer”. This tidbit comes from the book “History of Non-Dairy Whip Topping, Coffee Creamer, Cottage Cheese, and Icing” by William Shurtleff, and Akiko Aoyagi, page 199. I also remember the dinners that had the Campbell’s Soups in them. The popular one being tomato soup, and all the compartments were square. It was touted, on the back of the box, as a four course meal with your meat/entree, soup, vegetables, and dessert. I remember when those were discontinued because many stores did not want to stock that kind. I got one of the last ones my local store had in their supply after they were discontinued.